Travel tips around the Philippines and the world. Vacations are meant to be enjoyed, let us make it convenient yet affordable. I do appreciate it if you drop a line. There are adventures and misadventures but these experiences are priceless. It has been three years since my first and last dive in Moalboal. It wasn't such a pleasant experience, we didn't see much at that time and it turned out to be 3 of my dive buddies' last dive. A few weeks ago, it was the talk of the town. 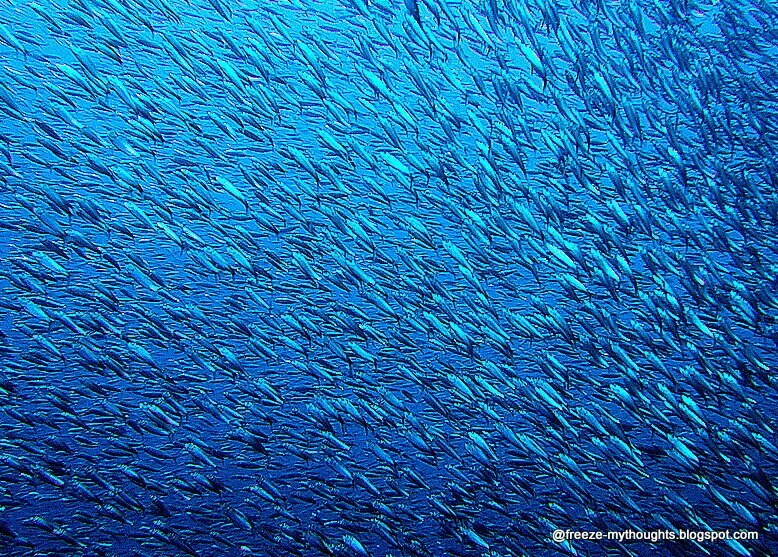 There have been consistent sightings of thresher sharks, whale shark and overwhelming school of sardines. Since then there was a renewed interest to visit the place by many including me. One Saturday, I skipped work, woke up before five in the morning and drove down south west to Moalboal, Cebu fleeting at an average of 80 to 90 kmph. Thank God for automatic cars, it was my longest drive ever. From the city, I drove on the first hour through south super highway, just go straight (not turns) all the way south upto the rotunda of Carcar, stopping for breakfast in Jollibee; they are open as early as six. My friend took the wheel the next half of the trip. Turning right on rotunda of Carcar, going up in the long winding road of Barili, crossing the paved road of Ronda and Alcantara (turn left on Ronda Plaza then right when the road splits), and finally reaching Moalboal after two hours. Make a right after Moalboal Elementary School passing a long small road towards Panagsama Beach, it's about 5 to 10 minute drive from the main road. There's a big road sign that leads to it, but we missed the turn. The locals are generally helpful to give directions, so feel free to stop and ask like we did. We arrived around 730 am, as scheduled but disappointed to know we were not off to sea not until an hour later... you know how precious sleep is. We met the rest of the group at Eve's Kiosk Dive Resort who went ahead the day before; they won't settle anything less than a three-day dive. Eve's probably have the most spacious parking slot in the area which can accommodate about 6 vehicles. We found a spot in Eve's exactly infront of Nelson's Dive Shop. First thing we had to do was order lunch at Eve's. When outside the city, it is customary to order in advance since it takes a while to prepare food from scratch. It is always best to order a meal ahead. Food was just mediocre. Dive #55. 830am. 77ft 46mins. As usual, I had equalization problems, took me some ten minutes before successfully descending beyond 10 feet sans a dive master eyeing on me. There were only two DMs, with two newbies and four other dives. All i could see are the bubbles coming from my dive buddies under me. Although it made me feel safe knowing they are just there. After a while, I went off ledge as my sinus were starting to clear; just in time when two thresher sharks appeared before us. OMG, it was my first time to see them, and seeing two at the same time was heaven sent. Later into the dive, we met another group giving hand signals, they just saw a whale shark... yes, they did and we missed it by a few minutes. Dive# 56. 10am. 68ft 52mins. 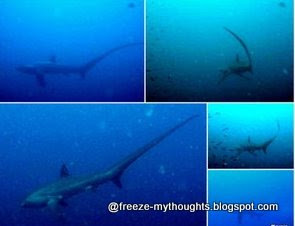 Second dive, I missed the thresher shark while the rest saw a glimpse of it. I was too preoccupied gazing how swiftly the university of sardines are going. Dive# 57 130pm. 88ft 51mins. After lunch, we went back to sea and the thresher sharks were just feasting on the sardines. It was a sight to behold. There were probably more than ten sightings on that dive. The thresher sharks appearing one at a time whipping the water to stun their prey - the sardines. Apparently, they are having lunch! I was stunned for a second when one was coming my way; we were just a few fin away by the walls of Pescador Island. My dive buddies who were diving for so many years, have never had that action-packed-close encounter with Thresher Sharks in their whole diving career. It was totally out of this world. At noon, we met the rest of the group that arrived from the city, our diver friend from Aquadive Inc. just organized a 5 day dive with 44 divers in total; arriving and leaving on different days. There's nothing like diving with them, everything is taken cared of. Finishing off the dive past five in the evening, my friend and I decided to sleep over in Panagsama, Moalboal. It is quite risky to be driving in the dark on that long winding road back to the city. Good thing we prepared for that possibility. Basic room for two with AC and private bath at Eve's costs P1,000. Upon checking-in, we hurried up to our room, got ready for dinner and totally forgot about the sunset. The shores of Moalboal has one of the best sunset view in the island. We went ahead to Marina Restaurant, a few meters away; it is owned by La Tegola, a famous Italian chain in Cebu. We were too hungry that we ordered ahead while everyone else was not in yet. We ordered exactly the same menu we had a few days back in their affiliate Idea Italia but it didn't taste as good. We hurried back to our hotel room before nine for our scheduled massage. It was a good thai massage for P400/hour. Next thing we knew, the sun has risen. We woke up too early after sleeping too early. Took our time for breakfast while our dive buddies went for another dive day. I drove back up to the city for more than two hours, fighting off sleepy eyes, constantly chatting with my friend since there is no radio signal three-fourths of the way. You have a choice between staying at the Bas Daku White Beach or Panagsama Beach. The Bas Daku White Beach has wider beach front while Panagsama Beach doesn't have a decent shore, it is quite cramped but most restaurants and dive shops are conveniently located here. Pescador Island is Moalboal's must dive spot. 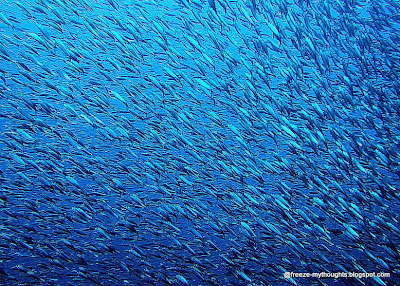 Among others, whalesharks, thresher shark, sardine run are amongst those must see in Moalboal. There are several dive shops in the area, and I've dove with these two companies, boat trips are usually scheduled and shared with other divers. For budget friendly vacation rental house in Moalboal, you can check out SeaBreeze Cottages. Here I am, trying to stretch the peso in my quest to see the world -- striking a balance between comfort and roughing it. Although I am tempted to go solo, I am ever grateful to have travel buddies who are as gangho as me. It may not always be as glorious as these stories portray, I love them dearly. As my way of paying forward to those who has unselfishly shared their insights I am writing about my journey, I hope you find my confessions helpful too. I swear, once bitten (by the travel bug), forever bitten. feel free to share, but don't steal contents and pictures. Picture Window theme. Powered by Blogger.